Well, well, well. The Instant Pot to the rescue again. Is there anything this thing can’t do? The day I can make ice cream in my Instant Pot is the day I give away every other appliance I own. 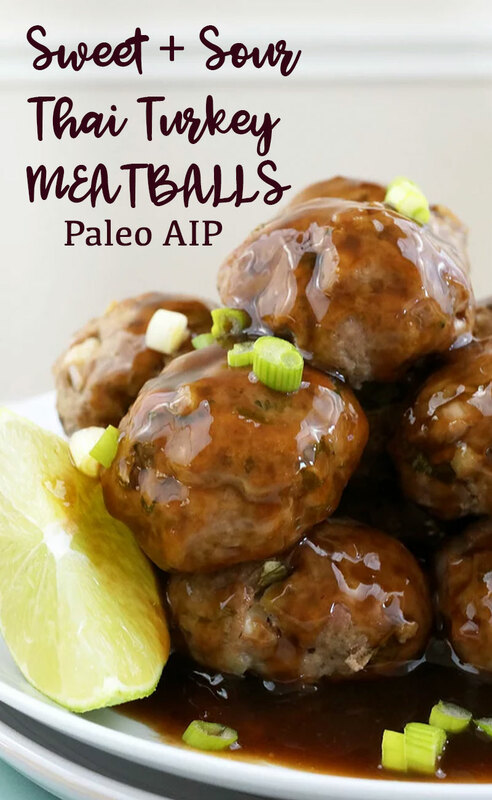 To celebrate the release of The Paleo AIP Instant Pot Cookbook, which is a collection of over 140 recipes from 37 of the best AIP bloggers (including 5 recipes from myself), I am releasing an early holiday-inspired IP recipe! Does anyone else start craving Thanksgiving food early in the season? I don’t see why we only eat such a nourishing meal one time a year. Pastured turkey, bone broth and vegetable-based gravy, roasted root vegetables, and beautiful fall salads.. hello!? I think EVERY week should be Thanksgiving. Some say it wouldn’t be as special, but I’d rather have my turkey & gravy multiple times a year and wean the special out of the main event. It’s not like I’d be eating pumpkin pie every week, but wouldn’t that be fun?I don’t know about you guys but I’m already planning my Thanksgiving menu. We are celebrating a couple weeks early in Omaha, so on true Thanksgiving it’ll just be our little 4-person household. Rafael counts as a person, and he gets his own plate too. I don’t want to spend all day in the kitchen for just us 4, so I’ll be making a lot of food in the Instant Pot. This turkey and gravy has all the classic flavors of our favorite holiday staple, except instead of 3 or 4 hours, it only cooks for 20 minutes! The gravy is based off my AIP Chicken n’ Gravy but thinner and has a bit of a different flavor profile (bay leaf, onion) and made from sweet potato. It thickens as it cools, so even if it looks a little thin right in the blender, let it cool just a bit for the perfect consistency. I used skinless, boneless turkey breast, which is the driest part of the turkey. When covered in gravy, it’s nice and moist and tender. By itself, it is drier than turkey thighs. You COULD brine the turkey for 24 hours in a salt-water brine before cooking in your Instant Pot. I’ll be doing that for Thanksgiving, but even without the brine, it’s still moist enough. No time for a full-on turkey dinner?! 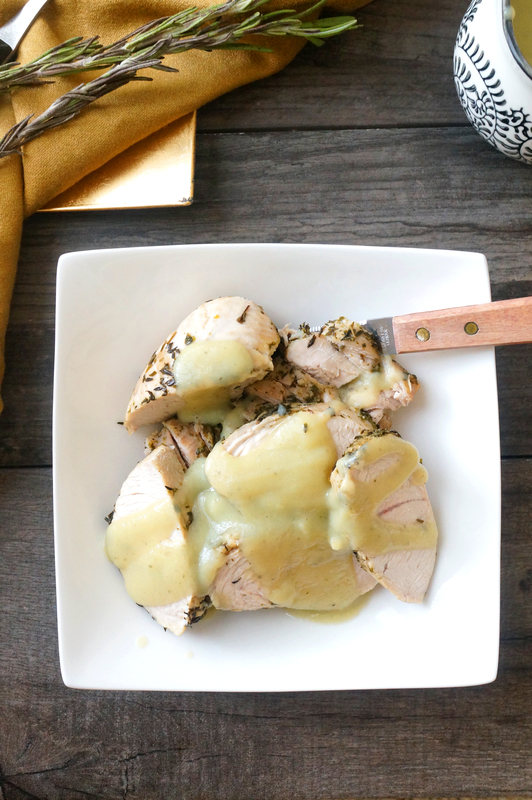 This 20-minute Turkey & Gravy is a perfect fix! Make the gravy: Add all ingredients for gravy to Instant Pot insert and seal the lid. Set the manual cook time for 5 minutes. When the timer is up, manually release the pressure. Using oven mitts or a thick towel, pour all of the contents of the pot into your blender. Puree on high speed until smooth. Set aside. It will thicken slightly as it cools a bit while you make the turkey. Make the turkey: Season the turkey on all sides with thyme, parsley, sea salt, and sage. Place in Instant Pot insert in a single layer, if possible. Pour broth around turkey and lay bay leaf on top. Set to cook using Poultry setting (15 minutes). Serve: When timer is up, manually release the pressure. Slice into 1/2-inch to 1-inch thick slices and serve with gravy. I have just been craving Thanksgiving stuffing like it’s the 3rd week of November or something. There’s just no better flavor profile to me than all the savory herbs + take-on-all-those-flavors turkey + sweetness o’ accompanying fruit. And then there’s those tasty, soak up all the goodness cubes of bread. Well since it’s been over half a decade since I ate traditional bread-based stuffing, there’s just got to be a little starchy something-something when I make the AIP thang. This recipe was inspired by the Hamburger Stew in The Healing Kitchen, which is 100% comfort food in a bowl! I wanted to make a version that’s a bit lighter and includes more delicious herbs inspired by my favorite side dish. This stew is everything you know Thanksgiving to be: savory, comforting and filling! Just not AS filling as Turkey Day fare. Heat olive oil in a large pot over medium heat. Saute onions, parsnips and celery with ½ teaspoon sea salt and the bay leaf for 10 to 12 minutes until softened and lightly caramelized. Transfer contents of pot to a blender with the broth. Puree until smooth and set aside. Crumble turkey into the pot. Sprinkle with remaining ½ teaspoon sea salt, thyme, rosemary, parsley, sage, and cinnamon. Cook until no longer pink then add the plantains to the pot. Cook turkey and plantains together for 3 minutes and then add the pureed broth/veggies to the pot. Bring to a boil, uncovered, over medium heat for 15 to 20 minutes until the plantains and the stew is creamy and thickened. Meanwhile cook the bacon in a separate skillet until crisp. Transfer to a cutting board to cool and then crumble. Taste stew and adjust seasoning if desired. 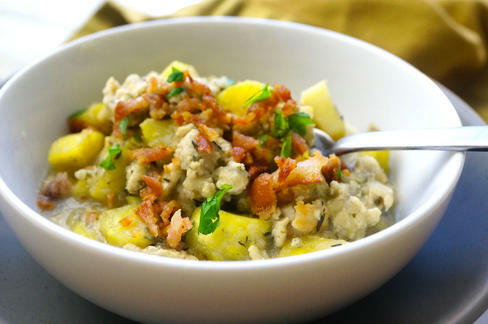 Top bowls of stew with crumbled bacon and minced parsley to serve. 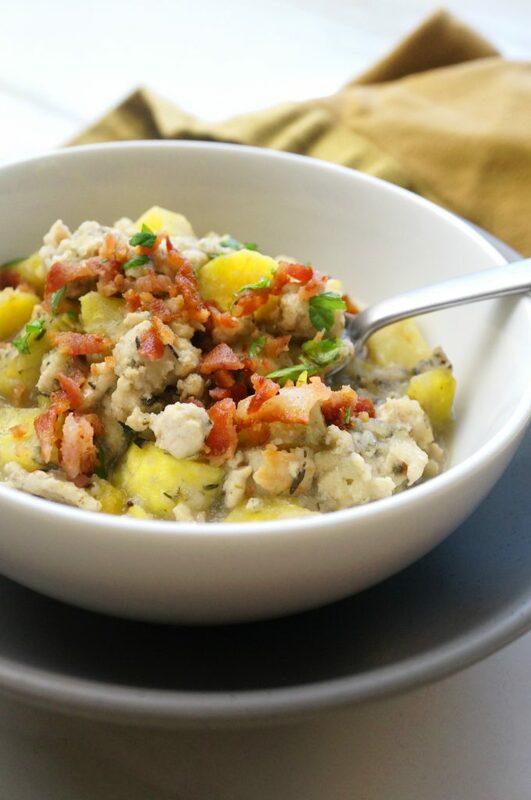 To make recipe in Instant Pot, "Saute" bacon until crispy and set aside, "Saute" veggies and turkey with seasonings in bacon fat until golden, add broth and plantains, seal the lid and pressure cook on "Manual" for 8 minutes. Top with crumbled bacon. Have you cooked with tamarind paste before? It’s pretty new to me, since I bought it when I was cooking my way through Paleo Takeout (which has an amazing AIP modification guide here) by The Domestic Man. I’m almost a year late to the game on that book, but we share the same publisher, and when I was at his house during our Vegas book tour stop and saw it on his overly impressive bookshelf (aka every Paleo cookbook you wish you owned or probably do), I said “MINE!”. Well I was more tactful than that. We had two weeks of really amazing Pan-Asian meals from Russ’ book, took a mini break, then I realized I had a few tablespoons of tamarind to use up and some sad looking ground turkey in my fridge (plus all of these other ingredients – yay for no shopping). Asian-flavor on the autoimmune protocol may sound difficult to achieve or like a real let down, but it doesn’t have to be! There’s several Asian-inspired recipes in The Healing Kitchen such as Teriyaki Chicken & Fried Rice, Chinese Stir-Fried Lettuce, and Speedy Shanghai Stir Fry! You just have to stock your pantry with a few (really, just a few!) staples to create your own Asian flare meals. 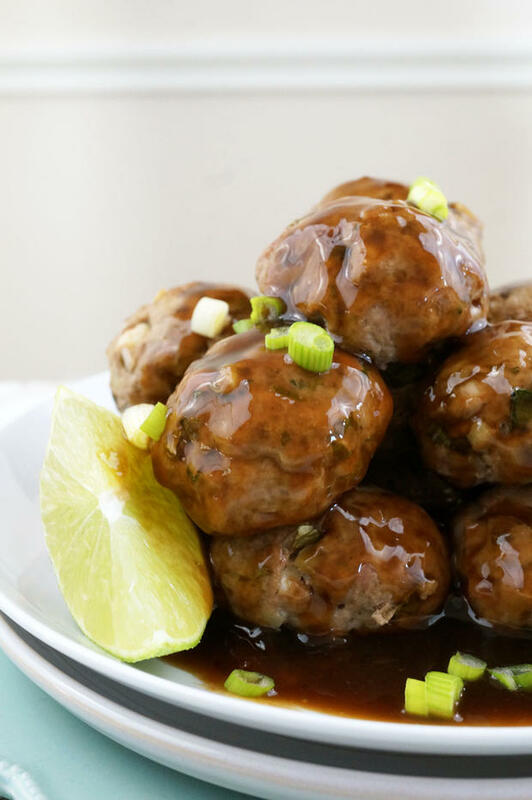 When you combine the above with flavors like ginger, garlic, green onions, honey, and molasses, you can create these abundantly rich and nutritious sauces to top meatballs, meatloaf, stir-frys of all types, cauliflower rice, and even roasted broccoli or glazed carrots! This recipe uses turkey thigh but you could try using an equally fatty cut of ground meat like ground pork, a mixtue of ground pork and beef, or ground chicken thigh too. Sweet & sour Asian-inspired meatballs pair perfectly with cauliflower rice! Preheat the oven to 400 degrees. Line a large rimmed baking sheet with parchment paper. In a large mixing bowl, combine the first 6 ingredients. In a small bowl, whisk together the tamarind, aminos, fish sauce, and sea salt until smooth. Stir into the herb and shallot mixture in the large bowl. Using your hands, mix the ground turkey with the rest of the ingredients until well combined. 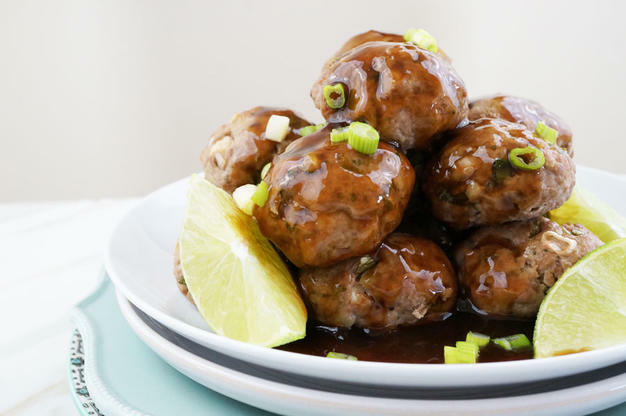 Form large 2 ½ tablespoon-sized meatballs with wet hands and place on the lined baking sheet. Bake for 18 minutes and let cool before tossing in the Sweet & Sour Glaze. Serve with lime wedges. Combine everything except the arrowroot and water in a small saucepan over medium-high heat. Bring to a low boil for 1 minute. In a small bowl, whisk together the arrowroot and water to make a thin, smooth paste. Remove the saucepan from the heat and stir in the arrowroot mixture immediately until thickened. 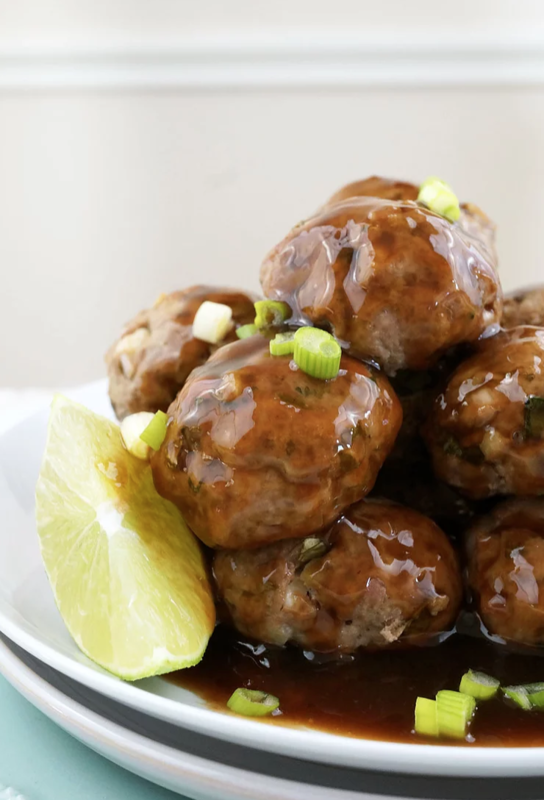 If serving entire batch at once, coat the meatballs in the sauce. If only serving a portion of the batch, coat only the portion you'll be eating during that serving with some of the sauce. This prevents the sauce from soaking into the meatballs when stored. Store the sauce separately in the refrigerator and reheat in a saucepan over low heat until pourable when ready to serve again. Probably one of the hardest tasks when cooking for the autoimmune protocol is coming up with different flavor profiles and textures. Without a load of spices and kitchen staples, it can feel pretty limiting at times when you only have meat, seafood, veggies, and fruit to work with! After almost two years cooking this way every single day (and multiple times at that), I have developed a few techniques to mimic some old standby cooking comforts that were always guaranteed to make a meal comforting and satisfying, namely cream and butter! Alas, dairy products and people with autoimmune disease and food intolerances often do not jive. Trust me, I tried to convince myself when I lived in Chicago that Jeni’s Splendid grass-fed ice cream didn’t cause me any gut symptoms since it was grass-fed milk, duh. That’s Paleo, right? Errr yeah. It took me 10 bowls of salted caramel (not in a row) until I realized dairy falls into the same category as nightshades for me (the danger zone). 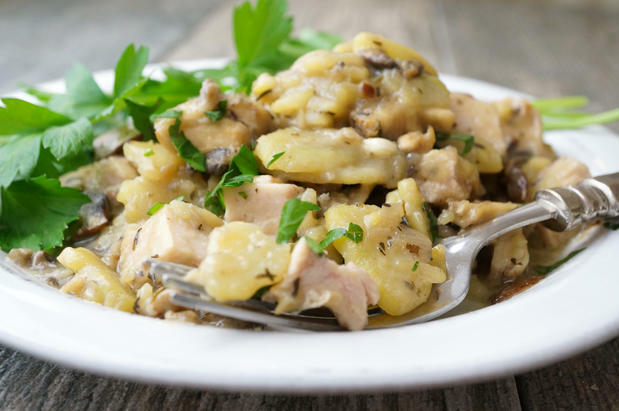 This recipe for Creamy Mushrooms, Potatoes, and Smoked Turkey is inspired by a recipe in The Healing Kitchen for Creamy Bacon Scalloped Sweet Potatoes (so good!!) 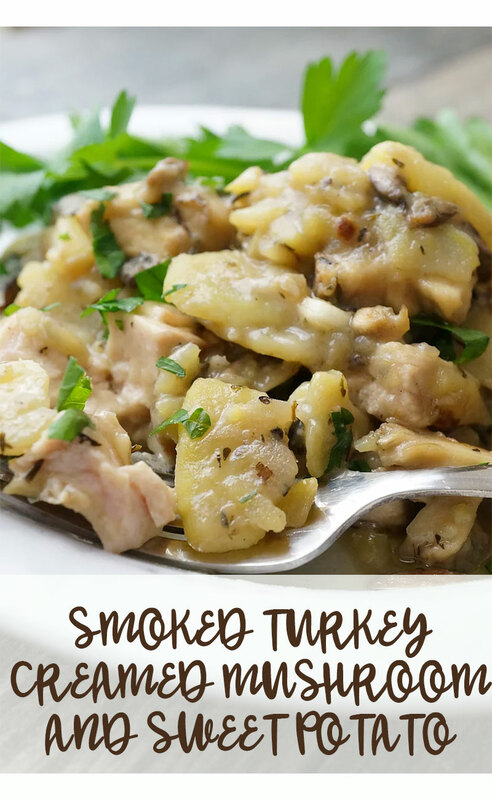 That recipe is a side dish though, and I wanted to prepare a cold-weather dinner for my husband and myself that would be packed with veggies, bone broth, and tasty smoked turkey! My Whole Foods sells house-smoked turkey breast, ribs, and chickens season with only salt and pepper. The pepper is on the skin, so I just remove the skin to keep it AIP-compliant. Mushrooms are the steak of the funghi world and add a meatiness and bulk to this dish that wouldn’t be present otherwise. White sweet potatoes are slightly sweet, mild, and starchy and literally melt into the broth and coconut cream! The smokiness of the meat breaks up all the heaviness of the coconut cream, broth, and mushrooms and makes a perfect date night meal for two (or leftovers for one!) Bon Appetit! 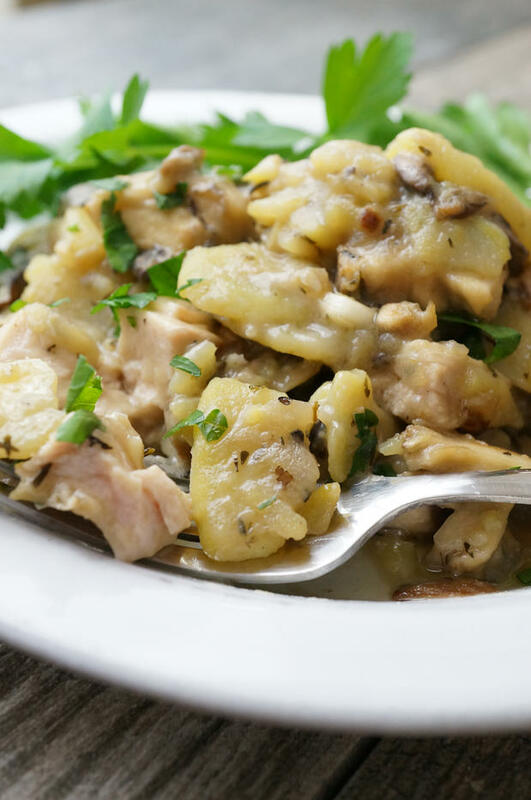 This yummy all-in-one dish couldn’t be any easier to make! Combine 1 cup coconut cream, broth, thyme, garlic and onion powder, ¼ teaspoon truffle salt, and sweet potatoes in a small saucepan. Ensure the sweet potatoes are covered with the liquid as much as possible. Bring to a boil over medium-high heat and cook uncovered for 4 to 5 minutes until potatoes are tender. In a small dish, whisk together arrowroot and remaining 2 tablespoons coconut cream. Stir into the saucepan along with the remaining ¼ teaspoon truffle salt /continuously for 1 to 2 minutes to thicken the liquid. Meanwhile, cook the mushrooms while the potatoes are boiling. Heat olive oil in a large skillet over medium-high heat. Add shallot, garlic, and truffle salt and cook for 1 minute until fragrant ensuring you do not burn the garlic. Add mushrooms to the skillet and cook for 4 to 5 minutes until tender, stirring every couple minutes. Add turkey or chicken to the pan to warm. Stir in contents from the small saucepan and mix gently and continuously until the entire mixture has thickened to a creamy and thick consistency, about 1 to 2 minutes. If you have reintroduced black pepper, add some fresh cracker pepper now. Serve sprinkled with chopped parsley with a simple green salad on the side.